I have always loved dance, but came from a very religious family where it was not encouraged. I remember bravely asking my mum one day if I could take lessons and was denied. I never did stick by things a long time at that age and my mum used that as an excuse to say no. But I always new the real reason - she didn't want to tell people in the church her daughter took DANCE lessons. In my 20's I began to explore dance classes - mainly jazz and ballet. 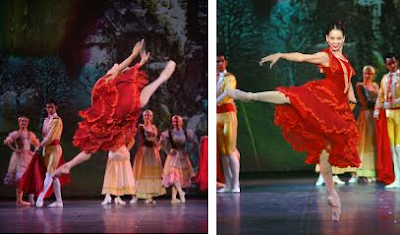 I loved them both but pretty quickly realized I didn't have the turnout necessary to comfortably do ballet. Then I fell into West Coast Swing. It was in my blood and I was passionate. I actually had a partner and performed around Seattle, often doing our choreography and costumes. When I moved to Canada, the dancing stopped, but I ended up becoming a dance costumer for 5 years creating over 220 each season. My daughter also danced. So I saw it - bleeding feet to the glory on stage - from the personal perspective of each of the dancers I worked with. 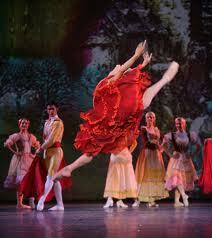 Traditional ballet and I have always had an uneasy love affair. I often find myself most drawn to performances showcasing the work of more contemporary choreographers. My free spirit chaffed at the limitations in classical choreography. On the other hand, when performed by technically superior dancers, everyone can appreciate the elegant beauty of the dancer's movements. 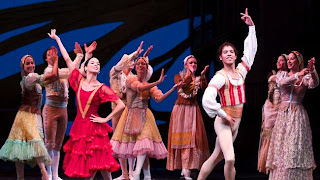 The story really is not important in a classical ballet - it defines the costumes and gives a reason for the dancers to interact. Beneath it all is structure. Group dance - pas de duex - he dances, she dances - pas de duex, small men's group dances, womens group dances, moves repeated 2 or 3 times and the list goes on. Watching classic ballets has to be absolutely amazing for me to enjoy it because of this and I am happy to share that the Cuban Ballet's offering of Don Quixote succeeded admirably. There were several things that made this performance stand out. The overall excellent training of the dancers was evident. The only glitch was the small men's groups had trouble matching timing and silhouette when they leapt. 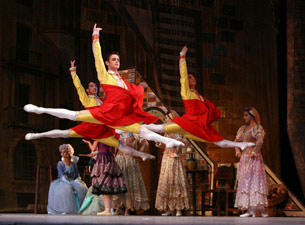 There was an extremely large cast on stage most of the ballet - over 25 at times - which was very unusual and enjoyable. Costuming was well chosen to blend them into groups you could identify. 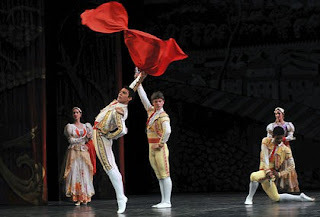 The cape work by the matadors was well executed. The characters of Don Quixote and Pancho Villa were pleasingly over the top comical. All these small notes helped to take away from the over-rigid format seen in traditional choreography. But in the end it was the 2 principals that took it to the next level. They were the icing on the cake. Viengsay Valdés who performed Kitri is undeniably at the top of her game. No one could fault her flawless performance from a technical standpoint, but what took it to the next level were those little details - a turn of the head, a flick of the hand, a move with that little extra flourish on the end. This is where the character of the performer comes out and many in classical training forget these details while they strive for perfection in their movements. Valdés used them exquisitely. By the time the she performed 5 challenging extended solo poses in the final act, the already entranced audience went ballistic. The same qualities were seen in Osiel Gounod who absolutely owned the role of Basilio. He was STRONG. Leaps were huge and mind-bogglingly high. Extensions were incredible. But again, where it went to the next level was his performance. There was a humour he infused into the portrayal of Bailio that drew the audience in and his timing in offering these tidbits was bang on. With the shrug of his shoulders, flick of his hand or a tilt of his head he could say to the audience, she's good, but watch what I can do. I think the first of 3 standing ovations in the 3rd act was in response to his stunning solo. 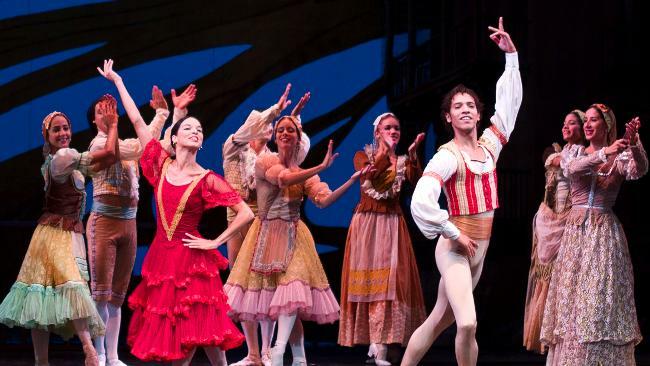 So many times the male dancer's training reduces them to leapers and the background in the pas de deux. Gounod stepped out from behind this traditional role to often steal the stage for me. He was actor, performer, dancer and athlete all rolled into one appealing package and I was utterly surprised to find it difficult to find pictures of him in this role - especially solo pictures. The other legendary male ballet dancer who also had this talent is Mikhail Baryshnikov. From other performances - look at the height he attains when he leaps. If this talented troupe is ever in town again, I will be first in line for tickets. I also would love to see them cut their very talented teeth on a more modern piece that would show off the dancers in a different light. Their classical work is impeccable, their performance skills high - wouldn't it be something to see them bring both of the talents to a contemporary piece. 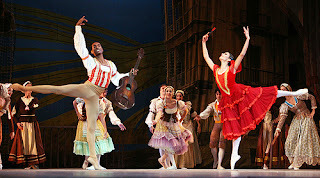 For more information the National Ballet of Cuba you can visit their website at http://www.balletcuba.cult.cu/. Hopefully your computer has the translate option as it is in Spanish.